Applicable scope: The reservoir farms near the rivers and lakes, hotels, schools, hospitals, factory staff quarters and other places. Water source heat pump system is a highly efficient and energy efficient refrigeration system that utilizes underground shallow geothermal resources (also known as ground energy, including groundwater, soil, or surface water). Stable geothermal resources throughout the year to meet the hot and cold demand, it is the best choice for alpine region to get hot water and heating. 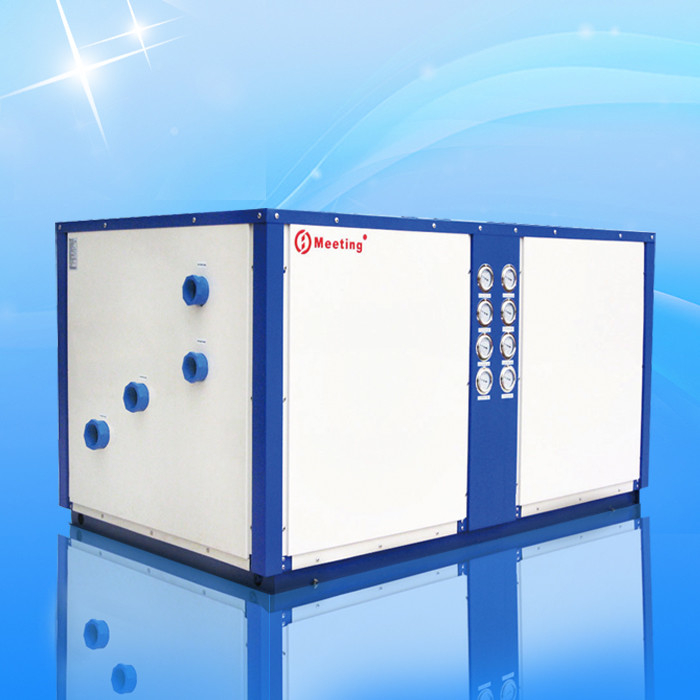 The machine adopts international brand-name compressor, with patented technology efficient heat exchanger, refrigeration and heating more powerful, high efficiency, automatic micro computer intelligent control technology, set the multiple protection function. After installation, our company will be responsible for problems caused by quality of production or raw material except the damageable spare parts of heat pump caused by incorrect man-made operation during the guarantee period. Intelligent Controlling service system will be avoid the long distance of the after sale problem. Wherever are you, our engineer can be controlled your equipment, when some questions occur on the equipment. Just tell us what number will be shown on the screen, then the engineer will be solve the problem. We accept OEM, ODM and customization. 24*7 after sales service. You will get satisfied service. We have More than 17years production and sales experience; Professional sales team. Fast delivery time: small order: 3-5 days, bulk order: 15-25 days. Water to water system pumps heat through the use of a simple refrigeration system, it pumps heat from the warm earth in the winter and move it into your house or business. In the summer, the process is reversed. Since it costs far less to move heat than to make it, much less energy is consumed. For closed loop system, water or an antifreeze solution is circulated through plastic pipes buried beneath the earth’s surface. During the winter the fluid collects heat from the earth and carries it through the system and placing it in the ground. Open systems operate on the same principle as closed loop systems and can be installed where an adequate supply of suitable water is available and open discharges is feasible. Loops can be installed three ways: horizontally, vertically or in a pond or lake. The type chosen depends on the available land area and the soil and rock type at the installation site. 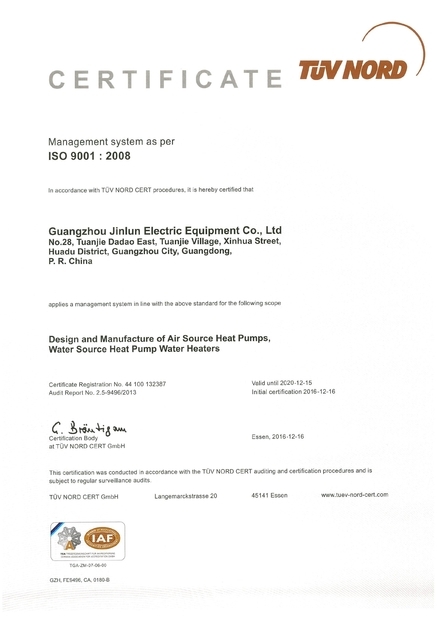 * Products design and produce heat pump by European standard EN14511, approved by ECM with its high efficiency. Factory audited by Bureau Veritas. *It also results in less supplementary heating to cover the full heating demand on the coldest days. *Workable ambient temperature range - 25℃ to 35℃. *Two speed energy saving fan motors. The speed of fan varies so only the required amount of air is utilized. The blades are specially designed to move as much air as possible at the lowest noise level.